Sometimes everything just clicks. My best friend from college called me earlier this week to let me know that he would be in NYC at 5:30 AM, today, Friday. I cleared my day for him - he is fun incarnate and is usually up for doing just about anything. This man is one of those people that is immediately likable. He was my first friend and college roommate in New York City - a Jew from Brooklyn. He taught me the ins and outs of this town and how to bankface my money. I learned what bagels, delis, egg creams and greasy spoons were. With no specific agenda, we started with breakfast at a diner - Joe Jrs. He said he wanted to visit a OK Cigars at 383 West Broadway in SoHo. Perfect, because he has a rental car, we are both ex taxicab drivers and we love an adventure. I don't smoke, but a cigar store sounds like an interesting visit. The weather is absolutely perfect. But we arrive 30 minutes before this shop opens. As we ponder what to do, the owner, Len Brunson, arrives early and welcomes us in. Our luck just seems to be getting better. I ask about his policy about photos and he just loves the idea - not the case with every store. We both agree how puzzling it is to have such restrictions and how antithetical it is to a business venture. There is a loft in this small, wonderful shop. Am I allowed to go up the treacherous ladder to take photos from the small loft area? A resounding yes. I get some great vantage points for shooting from above while my friend makes a purchase of $288. It certainly was worthwhile for the owner to open early. Ok Cigars, opened in 1997, is a high end cigar retailer. They also have an extensive selection of one of a kind antique smoking accessories. 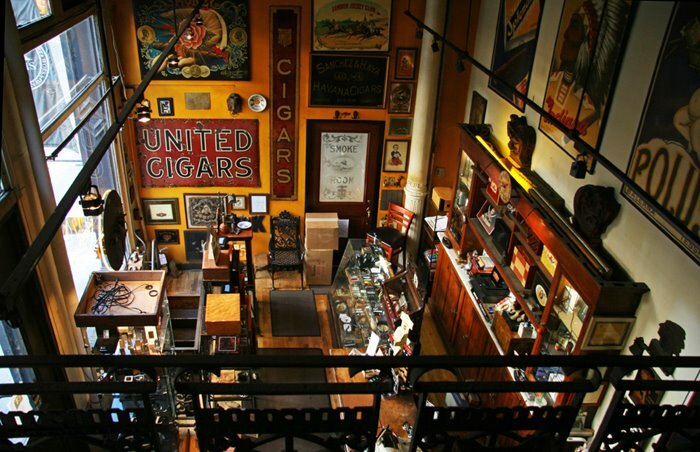 The shop has a tremendous woodsy, antique ambiance and is worth a visit, even if you are not a smoker. You can take a virtual tour of the store at their website. Len Benson is one of the nicest, most congenial and accommodating stores owners I have met.